The fabulous Poem in Your Pocket Day is just around the corner! I love these little-known but oh-so-celebratory holidays, and there are many clever ways to embrace Poem in Your Pocket Day! With minimal preparation today, you’ll be all set to celebrate. 1. Keep a short poem in your pocket. Look at it often and memorize it. 2. Print some favorite poems and pass them out in your classroom or homeschool group. 3. Post a poem on your blog or social networking page. 4. Add a poem to your email footer. 5. Text a poem to friends. 6. Tweet a poem using the hashtag #pocketpoem. 7. Distribute bookmarks with lines from favorite poems. Younger kids will love the ones on this free printable! Click the image above to download the Poetry Bookmarks. If you would like to share this free printable with others, please link to this post. Do not link directly to the PDF file. SHARE! 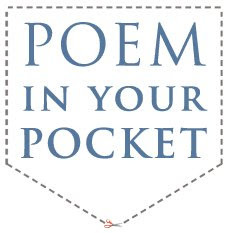 What poem will you keep in your pocket on Poem in Your Pocket Day?